The Oberon grain elevator. Buy this print! In part 1 of my May 31 grain elevator tour, I visited Elie, Tucker, Katrime (new), Steele Bridge (new), Gladstone, Helston (new), and Arden (new), and saw two CN and one CP trains... not bad! After Arden, I headed west to Neepawa for some gas, then south on highway 5. I intended to visit Mentmore first, followed by Brookdale and Oberon, but my GPS had other ideas and it took me to the Oberon grain elevator first. No complaints! As you can see, the Oberon elevator is quite weathered. The town of Oberon has basically disappeared, with the school closing a couple of decades ago and the elevator falling into disuse. I carried on west on highway 353 to Brookdale. There is one elevator left here, the former Manitoba Pool elevator. The UGG elevator came down quite recently but I missed it. Oberon and Brookdale were both on the CP Varcoe subdivision, which closed in 1978, I believe. There is an old "horizontal grain elevator" in Brookdale that I failed to photograph. Before grain elevators, grain was stored in warehouses. Few have survived but this one has. After photographing Brookdale, I headed north on a dirt road to Mentmore. The elevator is off in a field, so I parked on the side of the road and walked over to photograph it. After circling the elevator to take my photos, I walked back down the driveway to my car. Just as I was opening my door, a pickup truck pulled up. I explained that I was touring the province, photographing grain elevators. "Ever been in a grain elevator?" "Do you want to see one?" It turns out that he was the owner of the Mentmore elevator and noticed I was walking around. We went down to the elevator and spent the next 45 minutes or so touring the elevator. He explained how the elevator worked and operated the leg to show the little buckets zipping up. We peeked in a few bins and looked at the truck scale and the scale that was used to weigh outbound grain. We also visited the office visible in the right of the photo above. It was fascinating. Visit my page on the Mentmore grain elevator for more photos and information, including a photo of a Fairbanks-Morse scale! I really appreciated the chance to tour the elevator. I'm sending him a print of his elevator as thanks for the time he spent. After that excitement, it was time to move on. The last two elevators I had on my list of targets were Harte and Gregg. Both of these are on the CN Rivers subdivision so I was hoping for trains! The Harte grain elevator is an active elevator, owned by a nearby farm. There are prominent NO TRESPASSING signs so I did not get very close to it. Note the nearby overpass. That would be a great place to photograph westbound trains from in the afternoon and evening! The Gregg grain elevator is just down the line to the east. Sadly, no trains came along while I was photographing these two elevators. I headed south to the Trans-Canada and headed east back toward Winnipeg. I had a little time, so I decided I would stop in at Austin and photograph the elevator there again. I photographed it (and a CP train) back in July 2010 in pouring rain, so it was time for a few shots in nicer weather. As I was driving past the elevator to get to the sun side, I spotted a headlight off to the east. TRAIN! 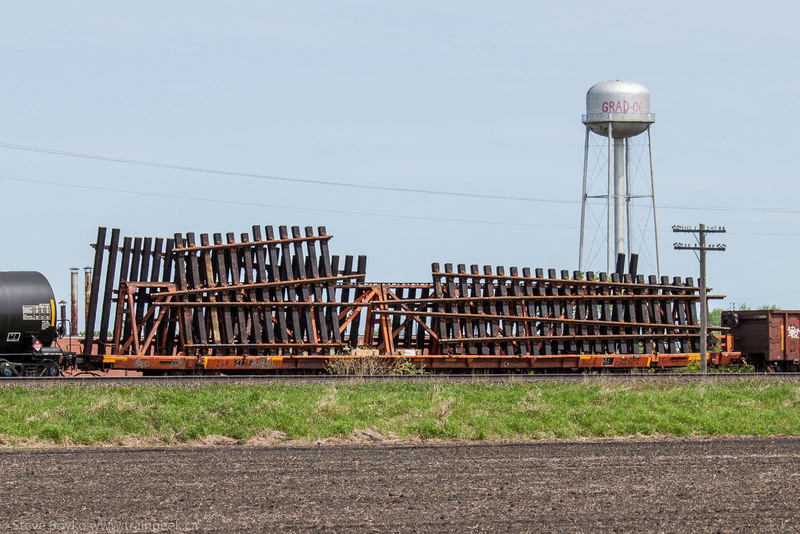 I parked and sprinted to get a decent location to shoot the oncoming stack train. After the train passed, I continued on east on the Trans-Canada. As I approached Portage la Prairie, I spotted CN 405 heading out on the CN Gladstone subdivision. I hurried as much as I safely could to get the shot near West Tower before the power disappeared from view. CN 405 in Portage la Prairie. That's the CP Carberry subdivision in the foreground. There was an interesting freight car on this train, carrying some parts for CN's 1:1 scale train set. I grabbed a late lunch at A&W and continued on toward the Portage downtown. As I approached, I spotted another CN train. This was CN 101. Another Dash-9, CN 2692, was pushing on the rear. You can see I was near West Tower, this time on the east side of it. 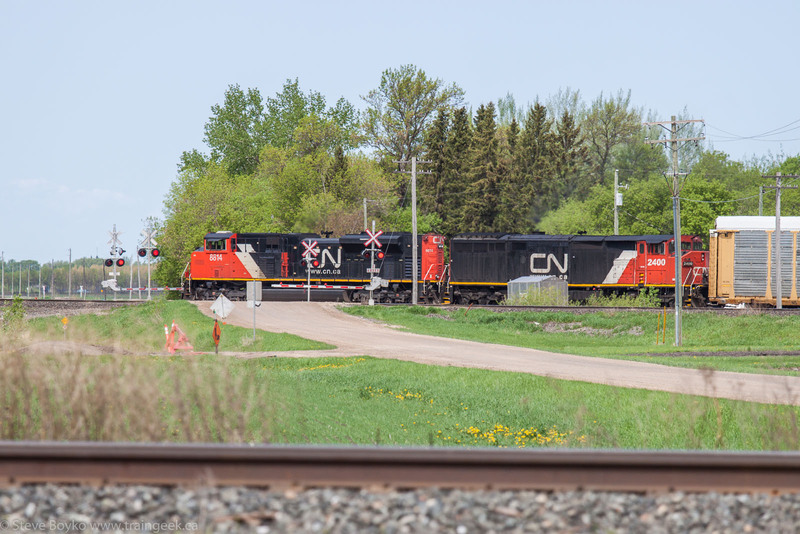 I drove around Portage a little bit, and a CP train came rolling west but I was not in a good position to capture it. It had CP 8542 and CP 8904. I knew VIA 1 should be rolling along any time, but I was running short on time so I elected to head out and try to catch them somewhere on the way. As it turned out, I spotted them crossing under the TCH approaching East Tower. I quickly pulled over after the crossing, ran back over, and took position as the lights went on and the gates came down. Nice to see the Canadian again. I decided to leave the TCH before Headingley and cut up to the CN Rivers subdivision on the off chance I could squeeze one more train in. I was lucky and got this one around mile 17 or so. Lots of grain elevators and lots of trains... a great combination! Great shots! I'm glad to hear you got to tour the elevator. I've found the further I get from the metropolitan areas, the nicer the elevator employees. Thanks, Karl! Expect more shots soon... there are many more elevators to see. This is a great series, Steve. Keep 'em coming. Seeing the elevators and your Portage railfanning makes me want to go back, the sooner the better. Thanks, Eric. Yes, please come back to Portage... I've always enjoyed your articles on it.